Christo-Lubes differs a lot from Krytox - It’s lumpy but not sticky, like shaving cream. It’s much less controllable than Krytox. Even experienced will have problem controlling amount and location of the lube. Saying it’s easy for beginners must be some kind of insider joke cuz it’s difficult to use for everyone, experts and newbs alike. Dab and slop is the best I could do. Stickiness and control - I found their viscosity too close to tell so it’s difficult to describe them in terms of thick or thin. More noticeable is degree of stickiness. 111 seemed least sticky, 112 seemed moderate, and 129 most sticky. I had easier time lubing 129 because it’s relatively stickier than others, giving me a tiny bit more control. How do they feel? - All pretty smooth, although not as smooth as 205g0 done right, but with a sort of muffling feel, like trying to whisper with a mouthful of shaving cream. Baffling thing is differences between the lubes are difficult to tell. Who is on first when? - Out of the three, I initially liked 129 the most, followed by 111. 112 felt more dampened. 129 felt more snappy while still smooth, reminding me of 205g0 when applied just right. But when I tried them later, 129 and 111 felt about same and 112 felt more raw, like 3203. Either my fingers are drunk or Cristo-Lubes need some time to settle in. Better than Krytox? - No. I still prefer Krytox because variations are more noticeable and enjoyable. I like 3203 (203g0) for its raw feel, 3204 (204g0) for its moderate milky feel, and I like 205g0 the most because it feels the best if applied well. I also use 205g0 to fix switches with raggy feel. And there is a difference in the type of smoothness between the two type of lubes. Krytox’s smoothness feels cleaner than Christo-Lube. What is it best at? - Having tried Cristo-Lubes, I now suspect its best use is with stabilizers and, possibly, Topre. Its best feature is that you can just slop it on without worrying much about stickiness causing sluggish return. TriboSys vs StoreUni grade 0 greases - StoreUni’s grease looks and feels is a bit thicker and seems to separate faster in storage (you can see hairlines appearing in the grease jar after a day or two). Don’t know if they also do in the switch. Thank you for buying all those and sharing your findings. A lot of people just like showing what they have purchased (nothing intrinsically wrong with that mind you), but posts like this both broaden and deepen our collective knowledge base which is invaluable. Interesting results! Thanks for doing a comparison and sharing here. It would be interesting to hear if you find any differences as you break in the switches too. From what everyone was saying I’m surprised that you found it harder to work with but maybe otherwise were under the spell of a new product? The reason I recommend it for new people is exactly because it’s hard to over-apply. I have done a few linears with 129, and I would agree that it’s really difficult to over do it with negative consequences, even after I tried to over do it, to a reasonable degree. The switch still feels buttery smooth but not sluggish. I do agree tho that if going for buttery, 205g0 does a better job at masking scratchiness, but more care has to be taken in terms of moderation and consistency. I also think the fluffly and hard to spread nature of 129 will lead to less switches per volume of lube, and the need for a larger brush, but it’s not like this stuff is super pricey. I try to not recommend 205g0 for someone’s first lube job (even 3204 can be overdone) but I wouldn’t hesitate to recommend 129 to a beginner. Now you end this off by saying maybe it’s good with topre, but now I need to know about that. Do you happen to use any topre and can test it? I am planning to lube my HHKB Pro 2 over the weekend. Stay tuned. Tried Christo-Lube MCG 112 on stabs. One word: WOW. I think Christo-Lube may be the best stab lube ever. Very little resistance. I practically filled the stabs with the lube yet stabs didn’t get sluggish. Christo-Lube is like perma-foam, fluffy enough to cushion and muffle but not sticky enough to slow things down. MCG 111 and 112 are similar so the two should be better than MCG 129 for stabs as later is stickier. Going to use this board with Christo-Lubed stabs for a week or two before deciding whether or not to re-lube the stabs on my other boards. A minor issue arose. Spring weight for the space bar is now tad heavy because its weight took into account sluggishness from the stab lube now gone, making upstroke too loud. I’ll have to either desolder the switch to reduce spring weight or put some sticky lube on the sides of stab to slow them down. Well that’s pretty damn effective if you had a heavier spring in your spacebar switch to overcome the usual lubes & now it’s to heavy with Christo. I’ve been using 3204 & GPL204 (grade 2 I believe) for my stabs for awhile now. While they are both super effective for smoothness & killing rattle they do add a bit of sluggishness on the stabilized keys. I got a jar of MCG129 & should be doing some testing later today (couldnt get to it last night), I might try it with a spare stabilizer also while I’m at it. Although I think you’re right that the MCG129 won’t be much different than the 3204 or GPL204. Gotta get some lighter Christo lube soon. Although I think you’re right that the MCG129 won’t be much different than the 3204 or GPL204. Actually, I recommended 111 and 112 over 129 just because I found 129 is stickiest of the three. But that doesn’t mean it’s as sticky as Krytox. 129 is definitely not as sticky as 3204. You should give 129 a try. It’s pretty easy to wipe off anyway. Nice, definitely gonna give it a try on some stabs later. I’ll post the results! I tested lubing Topre this morning. 205g0 and 129 felt equally smooth. 111 and 112 felt more raw. 205g0 was noticeably louder on upstroke than the rest. 129 was the winner, for me, in this test. Smooth, quiet, and cheap lube for Topre. Update 1: After lubing and testing full board, I think 129 goes better with BKE Redux Light, not Ultralight. So I finally messed around with the Christo 129 a little bit. I lubed two Cherry PCB mount 2u stabilizers one with a thick Krytox mix (GPL204 with a tiny bit of VPF1514) & one with 129 (I’m out of 3204 right now or I would tried one with that too as I really like 3204 for stabilizers). @donpark, you’re definitely on to something with using Christo-Lubes for stabilizers, 129 does wonders for them also! The one lubed with 129 felt a good bit smoother, was less sluggish, & was a bit quieter than the one lubed with thick Krytox mix. I’m definitely gonna give the other weights a try, but I think I may have found my favorite stabilizer lube here! With switches on the other hand though Christo 129 didn’t stand out nearly as much. It is definitely a good lube & can be used in lieu of Tribosys & Krytox lubes, but it just didn’t really stand out between the three. 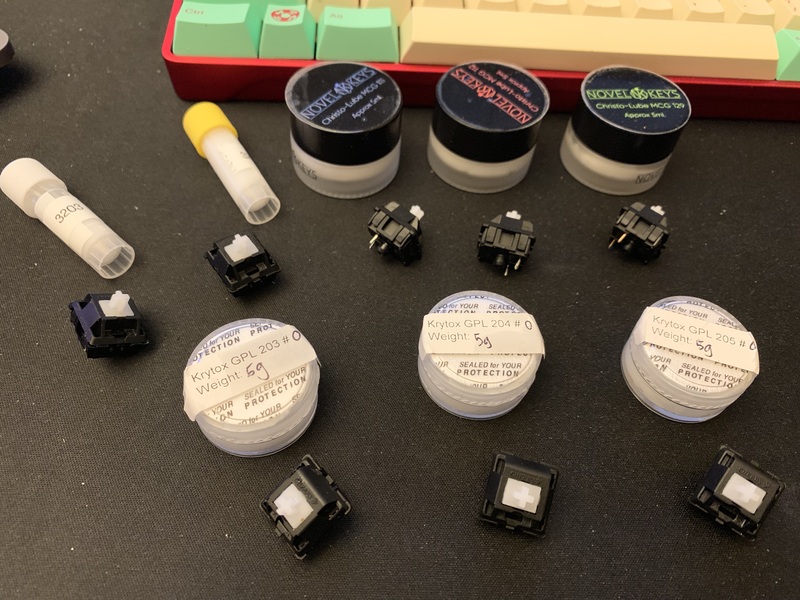 I had some 78g V1 Zealios that were already lubed with 3204 & some that were still unlubed so I used those switches to test. I lubed one up with 129, lubed another one up with the thick Krytox mix, then threw them on a plateless setup to test with caps on (the switches used with the stabilizers were lubed with 3204). Honestly not too much of a difference between the three. They all made the switches very smooth & they all had roughly the same effect on the tactility of the switches. The 3204 felt the best to me in this test, but only because I though it struck the best balance between the three. The 129 still kept the switch feeling a little raw, reminds me a lot of the way 3203 feels. While the thick Krytox mix made the switch feel a little smoother than than 129 but a tiny bit sluggish. The 3204 gave the switch a very smooth feel with almost no impact to the speed of the upstroke. All in I would say Christo-Lube is good stuff & I am gonna get more to use in the future. I’m also gonna grab a jar of each weight next time I order. With 129 it seems like stabilizers are it’s thing. It’s no slouch with switches, but doesn’t give any better of a feel than Tribosys or Krytox does IME with it so far. Not sure if that’ll change with the 111 & 112 though. sounds good then, do you think it would work well for something like the stock domes or 55g domes too? Or would that make it sticky like other thicker lubes? Honestly not too much of a difference between the three. Yeah. Subtle differences in stickiness and appearance (111 and 112 looked creamy where 129 looked more lumpy) were the only differences I could find which is frustrating. Anyway, I think they make fine additions to a tinker’s toolbox, for stabs and for occasions when Krytox doesn’t satisfy. do you think it would work well for something like the stock domes or 55g domes too? Or would that make it sticky like other thicker lubes? 129 slapped on generously felt a bit sluggish on stock 45g domes in-use so I’d be guessing but I think 111 or 112 applied frugally may work well. As to 55g domes, I don’t have any so hard to say. But 129 is definitely not as sticky as thick Krytox lubes. Problem is that they behave differently and very little is known about them. Please lend a hand and experiment with the lube so we can get to know the lube better. I did a build with MCG 111 on pre-retool MX browns this weekend. I agree it’s a little harder to spread out than Krytox. However I realized this was because the brush was already full of grease; Krytox seems to stick to itself well, whereas this stuff seems to stick better to surfaces. I was able to remove excess by first wiping off the brush then going back to clean up the overlubed part. Note that if you are used to Krytox, MCG 111 parts will appear overlubed. There will be a noticeable white layer, versus the usual rule of thumb for Krytox which is that if you can see white lube you’ve applied too much. After a while I settled into a pretty good flow for housings. I would grab a dot of lube with the very tip of my brush, then starting at the bottom of the rail make one firm stroke all the way up, then a few more to smooth and even it out, making sure to get the inside corners of the rails and not just the flat surface. For sliders, again, I had to get over some of my instincts from Krytox. Keeping in mind that it doesn’t spread very well, I used the same technique of grabbing a tiny dot of grease with the tip of the brush and applying it just to one side of the slider. Then I used excess on the brush for the front and back. This was very slow going at first, and I never quite settled into a rhythm. The switches are quite smooth once you get over the tactile bump (which has the distinctive and disappointing pre-retool MX scratchiness). I think this lube did a very good job overall and I can recommend it. Top-out and bottom-out do not feel soft despite the reasonably thick coat of lube, and there is no sluggishness. The MCG 111 also did not seem to dampen sound very much, even compared to lighter Krytox greases and oils like GPL 104 and 3204. You can hear in this typing video that the switches still have the high-pitched clack that you’d typically associate with an unlubed switch. The MCG 111 also did not seem to dampen sound very much, even compared to lighter Krytox greases and oils like GPL 104 and 3204. Yup. I found that 111 and 112 had far less effect on sound than 129. Not necessary good or bad, just info useful depending on the desired effect.